Do you have 5 minutes? Do you have a pantry? Well, then this recipe is just for you! 5-minute Tomato Basil Pantry Soup is just that… a recipe that only takes 5 minutes and all the ingredients can be found in the pantry. How easy is that!? All you need to grab is a can of tomato soup, a jar of marinara, a can of evaporated milk, and a few spices from your spice cabinet. You end up with a thick and velvety tomato soup that seems like it was made with heavy whipping cream. It is spiced just right with garlic, pepper flakes, and basil. Then the marinara adds just the right hint of Italian flavors without chopping garlic and onions and simmering all day! I love the Garlic Crouton garnish on this dish. You know what I made mine with- hot dog buns. Yep! We keep it real fancy around here. What can I say, it’s what I had and it works! You can really use any thick bread that you have in your pantry- hamburger buns, baguettes, ciabatta bread, hot dog buns. They all work. It’s the seasoning and oil that makes them yummy. You simply pour a few tablespoons of oil on the cubed bread, sprinkle with the seasoning & spices, and throw them in the oven for 3 minutes. 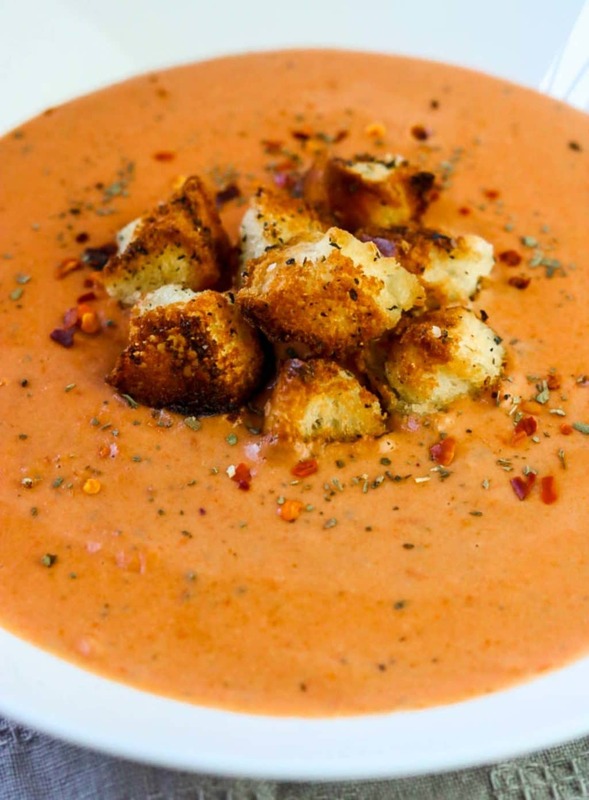 They are the perfect garnish to the 5-Minute Tomato Basil Pantry Soup. This would make a killer soup to have while camping! All the ingredients are transportable without refrigeration. Just remember to make the croutons ahead of time! You just need a can opener, a pot, a spoon, and a campfire. This is the recipe that you need on a busy weeknight when your fridge is empty and everyone is starving! You can pull this soup together in 5 minutes, make a couple grilled cheese sandwiches or a salad and you are the dinner winner! 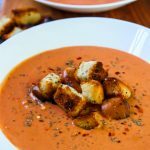 I hope you give this recipe for 5-Minute Tomato Basil Pantry Soup with Garlic Croutons a try in your kitchen! 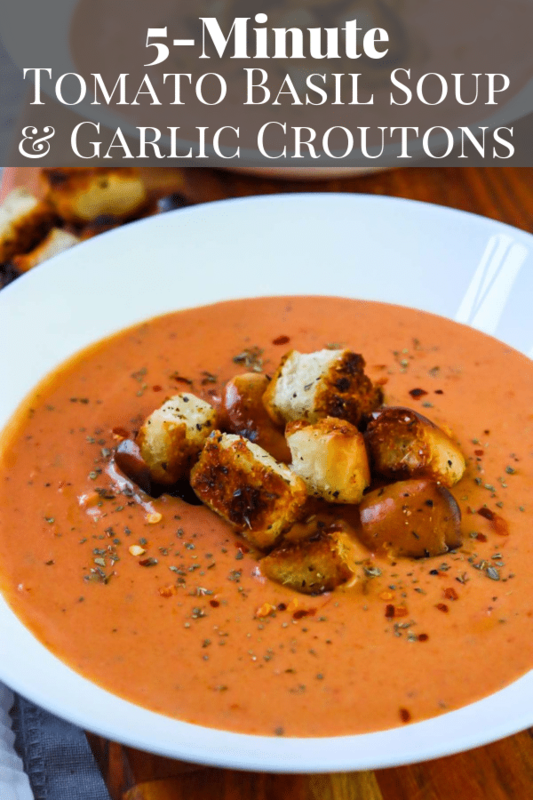 Save the 5 Minute Tomato Basil Pantry Soup with Garlic Croutons recipe for later! 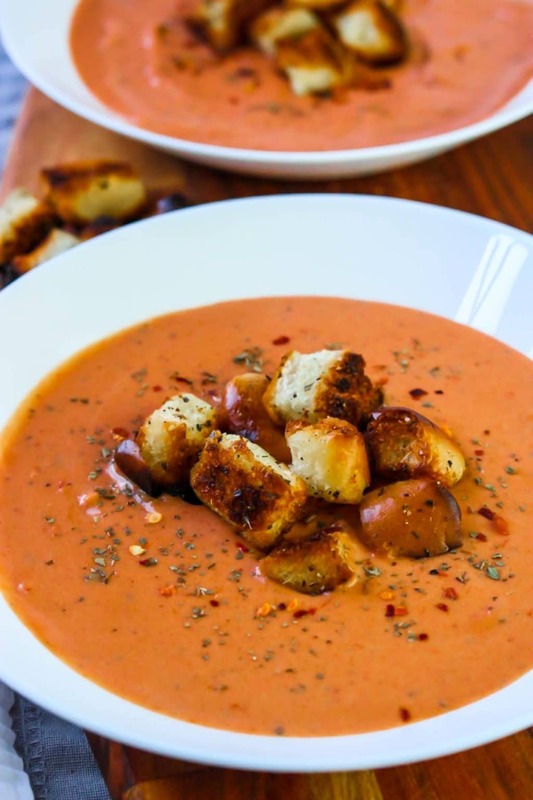 This tomato basil soup only takes 5 minutes to make and is made with ingredients solely from your pantry. It is over-the-top flavorful and unbelievably creamy. Make this on a busy weeknight with a grilled cheese for a dinner win! In a pot whisk all ingredients together and simmer for 5 minutes, stirring occasionally. Place the bread cubes on a foil lined sheet pan. Pour a few tablespoons of oil over the bread and toss with clean hands to coat. Sprinkle with the herbs and spices and toss to distribute evenly. If reheating you may need to add a little water or milk to thin. It will thicken in the fridge. Yumm! Reminds me of that yummy tomato soup I had in SLC! Ooooo I can’t wait to make this with grilled cheese!! I have all the ingredients in my pantry wooo! Perfect with grilled cheese. Can’t wait for soup weather!